Uhh- What the Hell is That? I ask that question at least once a day. Not unless my other choice is being forced to watch the movie “Yentl” over and over for 48 hours straight. Ouisar-san- “I`ll force the Offspring to eat it. I`ll tell them they ate it when they were babies and loved it.” That works about half the time. The percentage of success is dropping as they get older. Ouisar-san- “It`s in the fruit section. I`m betting on a fruit.” It looked vaguely familiar. Remarkably, once home, I realized that I had seen this fruit before. On a bag. My Canadian cousins had brought the dried version over from Thailand. Those were tasty. I volunteered myself as the guinea pig. Instructions for opening were included. Next time I`ll follow the instructions correctly for a neater result. Very tough outer layer. Squishy inside. Consistency of a peach. Sweet but with the aftertaste of something sweetened artificially. Pit in the middle. Very small. The fruit version of a sunflower. A lot of work for a little taste. Something good to eat while watching tv. Be careful with the knife. We Clampitts thought a banana was an exotic fruit until moving here. 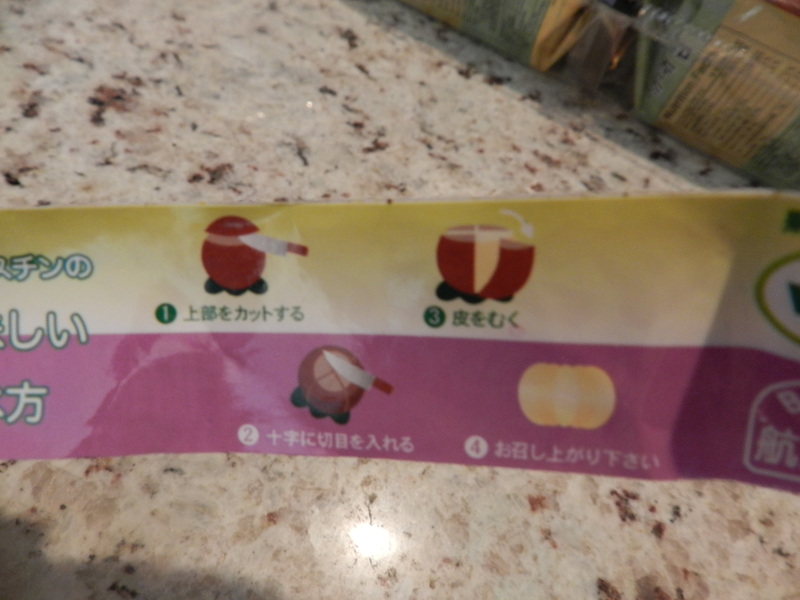 This entry was posted in Moving to Japan and tagged Amblerangel, Culture, Emily Cannell, ExPat, food, Hey From Japan- Notes on Moving, Humor, Japan, Mangosteen, Moving, Tokyo, Travel. Bookmark the permalink. 41 Responses to Uhh- What the Hell is That? I’m sorry, but… ovaries? I have a hard time imagining that, at the very least, orange pulp is ovaries. Sure that professor wasn’t pulling your leg or something? It just seems so illogical. It`s true. I know it`s hard to hear. But it is. The mangosteens grow on a tree. I haven`t seen one- just in pictures! It is possible – tis true! Whatever it is, it tastes pretty good! Please, more strange fruit posts! Michi- thanks for telling me your comments weren`t going through! Found two in Spam! I`m going to do more fruit and foods because it seems people really do find them entertaining. Thanks for the comments! Did ya`ll have a great time in France? Whew! I’m glad to hear you found them, I should have said something earlier. I first noticed it a couple of months ago, but didn’t think anything of it until it kept happening. We had a good time in France… but I’m still itching to get even further away next time. Japan calls…! You would LOVE it! Of course you know who to call as a tour guide! Hi Widya- thanks for stopping in! You are right- sometimes it`s best to just enjoy the flavor isn`t it! It is strange to think of a fruit that is so plentiful in one place being so unheard of in most others. 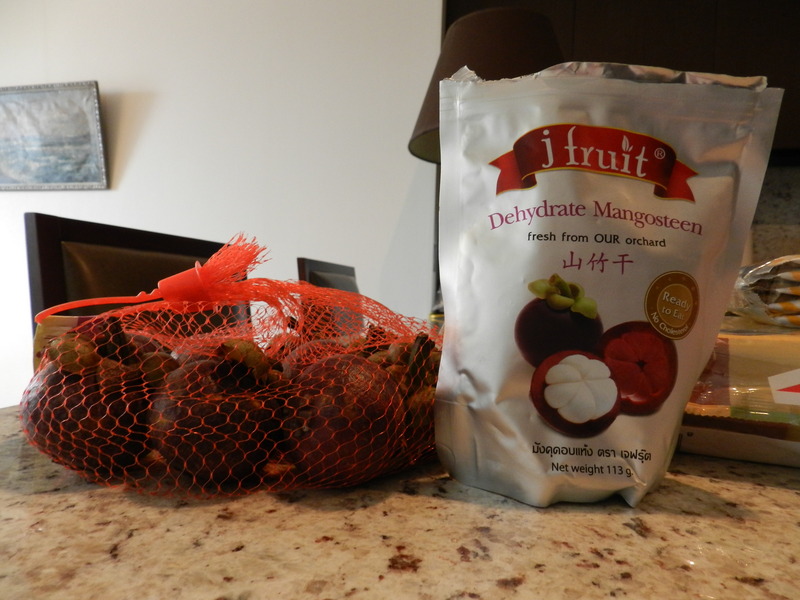 I’ve never eaten the dried version, but fresh mangosteen quickly became my new favorite fruit after we moved to Vietnam. God, they are the nectar of the Gods! Yes, I had to have friends teach me how to get to the fruit, but amazing once there. I actually did a post on these way, way back when. I have just been amazed at how many fruits come over from SE Asia! They are all good. Well- the Dorian is another matter…. You`re a rabbit- it`s in your contract to like Yentl. They look quite a bit like pomegranates. Only the insides are bigger. They do! The texture is completely different though. True- I didn`t want to ruin a good story with an unnecessary fact Hangaku! Your mother must have been a saint! Now I`ve got this big bag of them- I guess I`ll sprout some angel wings and do the same for my kids. Once. Thanks for sharing! I don’t want to hear anything weird about apple pie or peach cobbler. OK ? That fruit is very strange, the weirdest fruit I’ve had, is a custard apple, it’s green and bumpy, and the flesh inside is white, and full of black pips, the taste is very sweet, a bit like custard, and it has an odd texture. If too ripe, they can be a bit too sickly sweet. Never heard of a custard apple before Alannah. When I run into one I`ll taste it in your honor. Thanks for the recommendation! Mmm… ovaries! Never heard of mangosteen before. Looks a little sketchy, but if it tastes good, why not? Dana- perhaps someone reading this blog is trying to get pregnant and this could be THE PIECE of information that brings it home. Thanks for sharing. And of course the more graphic, the easier to understand. SO. There you go. And, yes. try a mangosteen if you see one! I love mangosteens! Instead of cutting them open with a knife, what I do is remove the stalk first so I could leave the center hollow and open it up like a tangerine. This way I won’t cut the seeds or whatnot. They’re usually sort of sweet, sometimes sour. Plus they’re pretty healthy because of the their powerful antioxidants. Strange to compare them to ovaries, lol. Ahh- I`ll try it that way. I have a whole bag. I do hear they are really healthy. Thanks for the tip! And thanks for commenting sabellamabelle! 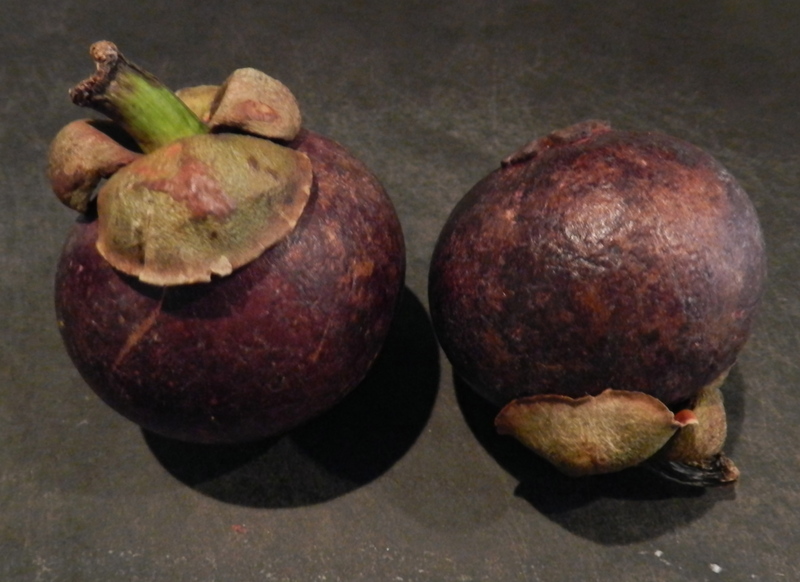 I’ve heard that mangosteen fruit is very good for you, an antioxidant. They were selling them as a drink for health benefits but at $25/bottle, I thought that was a bit steep. Enjoyed seeing your picture with Kathryn on her FPd blog last week. How’s Japan treating you these days? Hey Tar-Buns- Yes- wasn`t that a riot! Weird to see mine and Kathy`s grinning mugs on the FP page for a few days! My mom just wrote me about that juice and said it`s the next thing in health. It better be at that price! What am I saying- I pay that much for coffee every day. All is good here-how are things for you? The ovaries comparison made me choke on the coffee I was drinking as I was reading your post and the comments. My computer, fortunately, survived the consequent coffee spatter. The fruit that startled me the most in exotic Asia is called a dragon fruit. Not native to Japan, but you see it in supermarkets. Rurousha- I was JUST looking at that in the grocery store wondering what it was! Too weird! I`ll have to try. Unfortunately I am acquainted with the durian fruit…..I`m surprised if it`s sold nearby I can`t smell it. OS#2 and I sampled it over the summer in Borneo. Do you think there are durian kitkats? There seem to be every other flavor neh? I`ve been trying to comment on your blog for 15 minutes. Can`t figure out how to do it. ANyway- I`ll keep trying. Ah, Blogger doesn’t like WordPress. I’ve heard this complaint from several sources. I see you finally figured it out. Thanks for ganbatte-ing! How did you eventually trick Blogger into accepting you? Dragon fruit tastes quite nice, but – like all fruit in Japan – it’s hideously expensive. I can’t quite get my head around Japan’s attitude to fruit: it’s a gift, not a daily staple. Yikes. It kind of looks like a red onion in the cut up picture. I love mangosteens- they are known as the “queen of fruits”- the king being the durian. You have to eat the two together to achieve the YIN-YANG effect- as in balance. There are so many more fruits for you to try 🙂 One of the ones you will definitely fall in love with, hands down, is the Philippine pomelo- it is so much better than its Western counterpart. Guyabano (soursop) is also another ugly fruit that is oh-so-good. I guess for Asians, we know it’s what inside that counts. I would love for someone to fix me an Asian fruit plate. That would be really nice. I`ve not heard of a pomelo- will have to look that up so I can find one. The durian I`ve had and liked it until the smell got to me although so many people love it! I have a feeling that after a while it becomes an acquired taste which I would really like. Thanks for the comment. 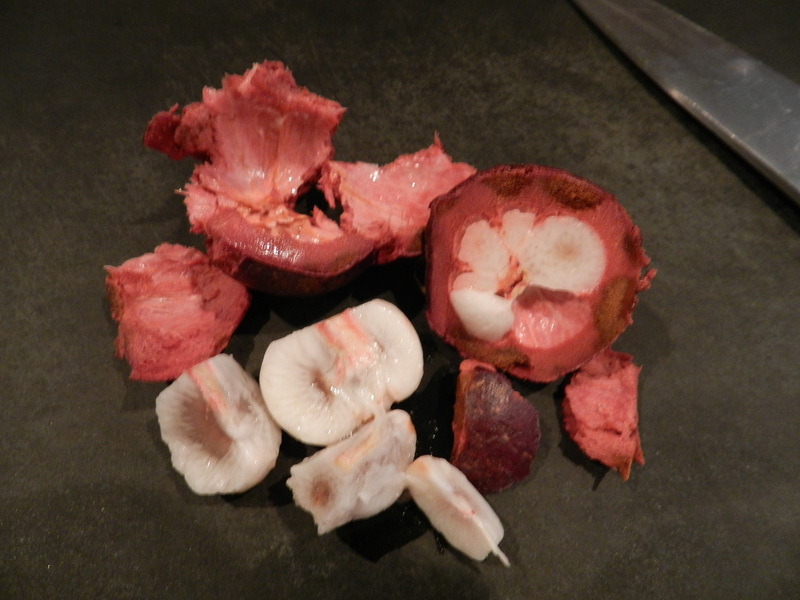 So now I`ve found out- after writing this post- that mangosteens are really good for you. Mangosteen can stained our clothes very badly if you accidentally had a few spill on your shirt. The colour doesn’t go away (T_T) So just beware when you’re eating it. Btw, Okayama has very nice orchards. You should visit there if you’re free. My friends used to buy me fruit jelly from okayama. They are awesome! The best I reckon! The fruit jelly- will have to keep a look out for that! I do love the tropical fruits. the Durian- well. Love is not the right word!